Plan de Paris des Magasins du Bon Marche. 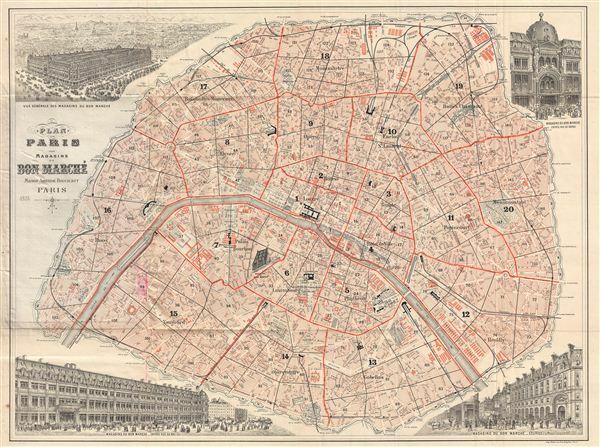 An attractive decorative c. 1893 map of Paris, France intended to promote the Magasins du Bon Marche. Centered on the Seine, this map covers the embastilled center of Paris showing all major roads, monuments, rail lines, bridges, and parks. There are four large decorative vignettes, one in each corner, all presenting difference views of the grand Magasins du Bon Marche. The Magasins du Bon Marche were constructed in 1852 by Asristide Boucicaut, the author of this map to be, Paris' first large department store. The grand edifice was enormously successful and served as a model for other department stores around the world. Today the Magasins du Bon Marche are still functioning as an active department store under the ownership of LVMH (Louis Vuitton). There are several known editions of this map, the present example being the least common, earliest, and most decorative we've found. Good some wear on original fold lines. Attached to linen covered binder. Vallee, Leon, Catalogue des plans de Paris et des cartes de l'ile de France, (Bibliotheque Nacionale) 1483, Ge D 2848.